Sweet handlebars! Only the truly passionate can achieve this greatness. Some would say it is an art. Speaking as someone who is trying to grow one, i'd say it IS an art! Ah yes, great stuff indeed across the whole blog! So this is part of your job? fantastic! That is a wonderful mustache! 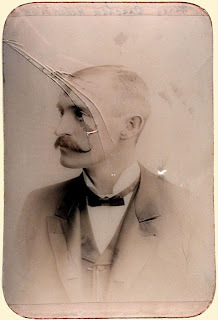 Yes, it actually grew out of an observation I made about the prevalence of the mustache in a set of 1880s cabinet prints, but then we realized they were everywhere. They next exhibit will be on Facial Hair of the Civil War. Almost no one was clean-shaven! I almost didn't believe it when I saw this blog on BoingBoing - other people who appreciate hirsute nostalgia! this site is definitely going on my favourites. If you come upon any good mustachiod bicycle riders in the pre 1900 era, please contact me. tas :at: tariksaleh ;dot; com. I will return frequently. Finally, a site for the moustache aficionado! Here's my previous effort, sadly shaven after the Safari was over. 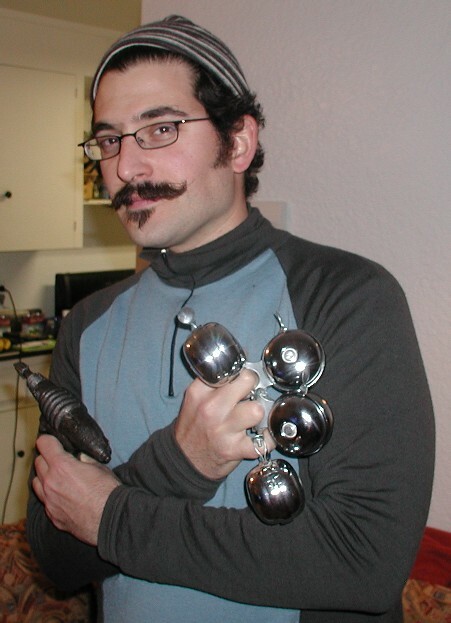 I'm cruising with a Hollywood Goatee now (the wife is not as fond of the lipwarmers), but I do believe it will soon be time to resurrect the bartender's handlebar for proper winter drinks. That mustache looks so good to twist whilst scheming. That do-gooder Dudley Do-right will never catch this man!